The famous words yelled proudly and assuredly by the greatest boxer that has ever stepped foot in the ring. He claimed it, and sure as hell lived up to it. Tyson was on bad dude but when it came to the mentality of the sport, and the mechanics and psychology of boxing, no one did it better than Muhammad Ali. No one, in almost any sport, not just boxing, created a public persona quite like Ali did. Every change he got he was in the public eye and in front of cameras talking trash and spinning rhymes. He knew he had the gift of gab and figured out how to market himself well and us it to his fullest advantage. In today’s day and age Ali would have been king of social media, he accomplished the equivalent of this back in the 70’s. It really is quite a miraculous feat when you think about it. Muhammad Ali unlike some other celebrities who can’t stay out of the public eye after they retire kept to himself and out of the public eye as he got older and his Parkinsons continued to get worse. Ali passed away June 3 2016 in Scottdsdale, AZ. He was 74. We lost another great part of American History with Ali passing away. 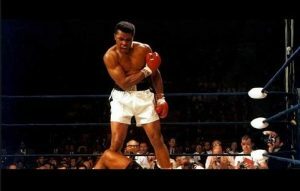 He created so many famous moments in history as well as in the sport of boxing. Muhammad Ali will be sorely missed. Another legend recently lost. The great David Bowie. Fascinating in his own special way, sort of a Johnny Depp Mad Hatter of the music industry. His career was absolutely amazing in how far it reached and how many fans he touched. I am not sure if you can place Bowie in one genre or category of music as he performed everything from what is considered rock, to having a tremendous Christmas duet with the one and only Bing Crosby. Not many people living in to the 2000’s can say they know who Crosby is much less recorded a duet with him. Bing was so impressed my Bowie as a young artist they had an impromptu collaboration that took off and is still played every year to this day at Christmas time. Bowie brought a certain flare to his music and his character that attracted a different kind of following. I really feel like he was the first version of say a goth or emo kind of fan attraction. His music and performance were just off the beaten path enough for the misfits to love it, but sounded good enough that it still picked up mainstream radio play and attention. Being able to span audiences like that is something that others have tried but most are not successful at it. Bowie, though again has not had any recent contributions, was involved a little in acting as well as writing. He will be sorely missed for his contributions not just to music bet being the icon that he is. It is rare, and I know there are plenty of stories about him, that we get iconic artists that aren’t involved in so much debauchery that they can not be held up as decent role models. Bowie though different, left the world better than he found it, and that’s worth something. The most recent demise that took the world by storm would be that of the pop music icon Prince. The historic calssic songs that Prince made legendary will now live on in infamy with the greats. Songs like Purple Rain, rasberry beret, 1999 and his iconic Super Bowl performance cover the Foo Fighters song The Best of You. Prince certainly had his quirks as a person, but as an artist he remains unparalleled in his ability to perform, excite, and entertain. Though it is honestly hard for me to say that Prince will be sorely missed as its not like he has been producing new music as of late or anything. He truly was an icon and it does seem like we are losing a lot of those lately. Whatever your music style or preference, sing purple rain in your car sometime this week. Post Sponsor: Best Tree Service Memphis specializing in tree root removal. Billy Joel seemed to be on to something with this one. Normally I would not actually use this particular to derive life lessons from, as it is condoning “bad” behavior, and holding that behavior up high enough to say that if you are not participating in this kind of behavior, then you are not really “living”. Therefore, you were a “good” person who never lived life to the fullest, so you “died” young regardless of your age. That being said… I don’t know what the average age of death is currently across the country, I am sure a quick Google search could answer that question. But it seems as far as celebrities go, they are dropping like flies and barely making it past their 50’s, if they make it through their 20’s. It makes me sad, and I can’t help but wonder if that is the character and nature of a celebrity, that they eventually become or always were self destructive. Maybe that’s what makes them what they are to begin with, or is it the additional stress and pressures that the media places on these famous people. The pedestals that we as fans place them on seems to only set them up for failure and apply a weight on their shoulders that no human can burden. I don’t know the answer, I know Jimi Hendrix used to say that he could see music… literally hear music and see colors. To me, that’s a result of a lot of drugs, but i sure appreciate his music. Drugs or no drugs he was certainly wired in a way where his brain worked differently from the rest of ours, and he was a tremendous artist because of that.. I can’t help but feel though a continual pressing urgency to live life. Your day could be tomorrow, what will you do today that made it worth it. Copyright © 2019 Tribute. Powered by WordPress. Theme: Accelerate by ThemeGrill.